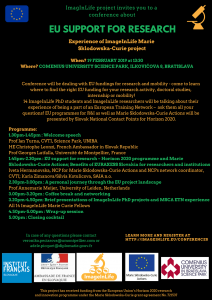 The conference will be dealing with EU fundings for research and mobility, come to learn where to find the right EU funding for your research activity, doctoral studies, internship or mobility! 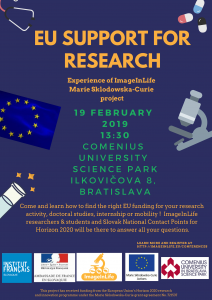 14 ImageInLife PhD students and ImageInLife researchers will be talking about their experience of being a part of an European Training Network – come and ask them all your questions! EU programmes for R&I as well as Marie Sklodowska-Curie Actions will be presented by Slovak National Contact Points for Horizon 2020. Please confirm your presence at this event by filling in the following form. 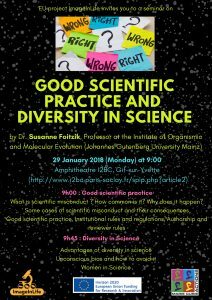 GOOD SCIENTIFIC PRACTICE AND DIVERSITY IN SCIENCE seminar with Dr. Susanne Foitzik (Johannes Gutenberg University Mainz) took place on 29th January 2018 at 9:00 at CNRS Gif-sur-Yvette (France). The seminar was open to public.